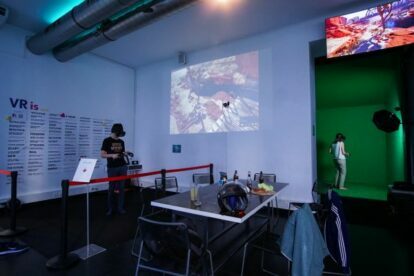 As they claim on their page: it’s the first virtual reality café in Europe! What is Virtual Reality (VR) or Virtuality? In case you’ve never heard of it before, Wikipedia tries to explain it here. VREI is not only for gamers. While fans of games enjoy racing challenges and many more types of what once started as video games, other awesome simulations are waiting for you. To amaze yourself, you can go on virtual sightseeing trips all over the world – straight from Vienna’s seventh district! No need to pack or go to the airport anymore. With Google Earth and virtual reality you sit right in front of Golden Gate Bridge, feel like you can touch the Great Wall of China, or stand in front of St. Peter’s Basilica in the Vatican. You can also fight your fear of heights and rollercoasters while standing on solid ground, paint like you never did before, or experiment in the tech lab. The variety of adventures makes sure there’s something in it for everyone. Also, their games and simulations change over the year to keep the offer fresh and exciting, even to frequent visitors. Find the full list of current games and experiences on their website.